You guys know my love affair with food... I mean it's the reason I travel! Besides my love of travel itself, obviously. I spend all my money on local foods, restaurants, sweets, treats, breads, spreads, coffees, drinks, restaurants, cafes, supermarkets and local markets ~ I'm not joking. I spent 27 euros on new sneakers here as I left mine in Switzerland! I was prepared to spend 30 euros, no more. My money here is for food. And here is a rap up on some of the best places we found during our week spent in Paris. When you need fast food that's not actually fast food, this place is amazing. Grab and go hot quiches, winter soups, salads in boxes, juices, yoghurt parfaits, baguettes or rolls. This one was a walnut and raisin loaf with marinated veggies, goats cheese and rocket perhaps... It blew my mind it was that good! I could have eaten this everyday! If you're not a bread fan but like simple meals, this is the spot for you. It's Israeli food in Le Marais and it's delicious. There is the option to have anything and everything served in a pita but we chose not too. The menu is written out a little strangely and there is no English option. Just see what people are eating and ask the lady at the register for some extra help. We ended up ordering too much but we needed a good dose of veggies so we survived! Dipping sauces ~ the tahini is the best! This place is well know for a reason. Having been making pastries since 1903, it's no wonder people travel all across Paris, France, Europe just for afternoon tea here. A total indulgence for me as I knew what I was in for ~ sugar, dairy, possibly gluten depending on what I chose ~ but I had to go anyway. I have been here before and had been looking forward to coming back some day (8yrs later). Order what ever takes your fancy, but if you want what people come here for, and what Angelina's is known for, then order the Mont Blanc (sweet) and the chocalat chaud (hot choccie). Given that this is not common food for me or B, we opted for sharing both of these. And we are glad we did. The Mont Blanc is a chestnut paste enclosing the freshest cream you can imagine, sitting ontop of a tiny meringue base. And the chocolat chaud is the richest hot chocolate you could imagine. 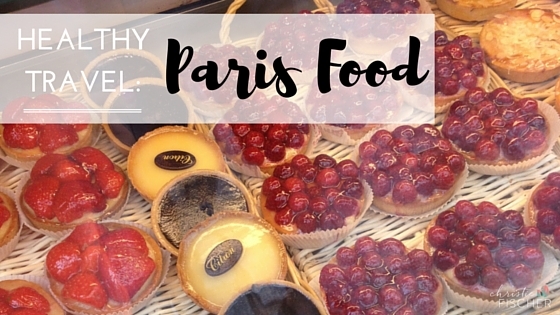 There are many health food stores around Paris selling organic fruits and vegetables, gluten free products, dairy free yoghurts, raw chocolates, and whatever else you would like to find in such stores. To find them, look out for the word "BIO" which is short for Biologique, and essentially means Organic over here. You can also use Google to locate one near where you might be staying. In large supermarket chains such as Carrefour you will also find a large range of Bio products as well, just as you can find organic in Coles and Woolworths in Australia, and in Ralphs and Vons in the USA. Smoked trout + jambon + mozzarella + rocket + cherry tomatoes + olive oil + salt. Voila! And for lunch one day, something very similar only made into His and Her salads. And if you're anything like me, make sure to grab your favourite French pastry from wherever it looks the best! A chain called PAUL does exquisite pastries and breads. And this my friend is a palmier. It's exactly what it looks like ~ pastry and sugar. It was my favourite when I was a little girl and my French grandparents would ask what I would like from the patisserie. It was always this. And it still is. Gluten and sugar filled, my inner child demolished every little morsel. I wish I got here! It's a cafe that's run by the same people who run Ici Self Care which is a place dedicated to women and harmony. YUM! They have yoga classes daily and a gorgeous boutique-esqe gift store with incredibly high quality brands. I found this place the afternoon before we left and just could not get there! I would have died and gone to Heaven! Have you been to Paris? 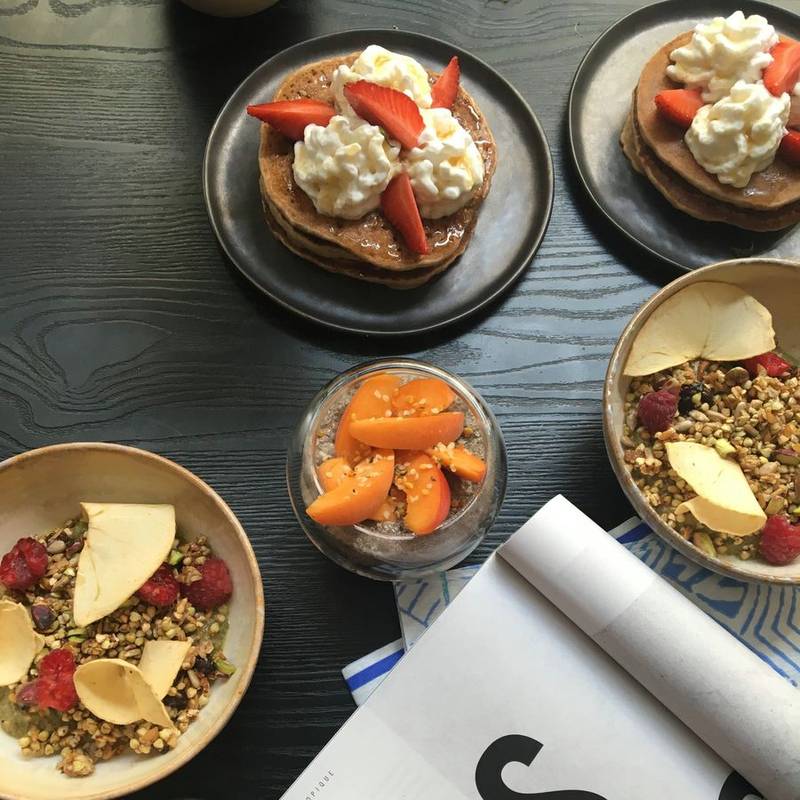 Do you know of any other amazing foodie spots I should add to my list for next time? Please let me know below! Au Revoir! TRAVEL :: WHAT DO I TAKE IN MY SUPPLEMENT BAG?